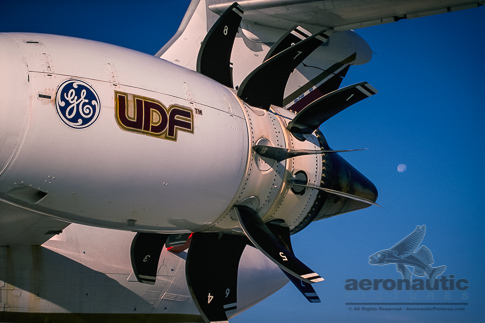 UDF – UHB Experimental Jet Engine stock photo captured at sunrise. This experimental airplane photo illustrates a GE Ultra High ByPass airplane propulsion test engine aimed at increased fuel efficiency. Download this high resolution air travel stock photo today. Another from our airport stock photos category designed to be images for website and more – download stock photos as soon as your order is placed! UDF – UHB Experimental Jet Engine Stock Photo GE Unducted Fan aka UHB Ultra High Bypass Jet Engine or Open Rotor gas turbine engine shown on a MD-80 airplane test bed aircraft. This was a test flight effort to examine the green flight technologies, noise and fuel efficiency merits for environment friendly air travel operations. Shot in the desert North of Los Angeles at sunrise, the setting moon is visible in the background on the right side of the frame.